Launching an in-person or virtual nutrition practice can feel overwhelming. Finding the tools and resources you need can leave you running in circles searching for answers. 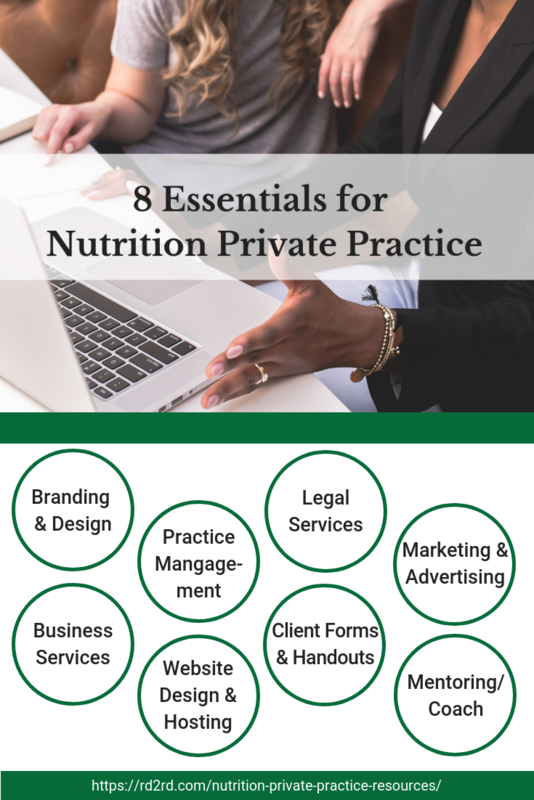 From creating a business plan, to website design, client education materials and marketing, a successful nutrition private practice requires a set of tools and skills. This article features eight essential elements that every nutrition private practice owner must consider. In addition, it provides suggested resources and features insight from private practice owners. Before you jump in, have you taken a moment to consider if private practice is right for you? Many dietitians have chronicled their experience launching a private practice. Links to these posts are included throughout this article. You can benefit greatly by reading these and considering how you will navigate a similar experience. A checklist can make it easier to keep track of the tasks you need to complete. It can also create motivation and provide clarity on your private practice launch journey. For a more comprehensive resource, this 2-part book series details the 10 Steps to Start Your Own Business and the 10 Steps to Grow Your Own Business. Your brand is more than just a logo or a name. Branding and design include essentials like business cards, social media graphics, stock photography or professional photos to elements such as colors, fonts, and your style. Decisions about branding will be influenced by your target audience as well as your personal style. Your brand should feel both authentic but also be unique and memorable. Hiring a graphic designer or branding specialist to create essential brand elements is one approach. You can also take a DIY approach and leverage design tools such as Canva to create branded materials for your business. To get top quality results, you will want to learn how to think like a designer and understands the basics of graphic design. You can learn to create gorgeous graphics for your business including social media banners, business cards as well as flyers and handouts for your clients. In this article by Jenna Gorham, RD, she gives great insight into the value of having clarity about your brand and how it helped her grow her business. How are you going to run the day-to-day aspects of your practice? Perhaps you’ll utilize a comprehensive electronic health record (EHR) complete with scheduling, online client paperwork, messaging and payments. Will you also offer virtual visits? There are several EHR platforms that are built specifically for dietitians. The features and functionality vary, as well as the pricing. Most offer a free trial period where you can give various features a test drive. In this article, virtual practice owner Kristi Coughlin, MS, RD provides detailed recommendations for how to select a platform for running your telehealth practice. When trying out various options, do more than just browse around the platform. Embed the scheduler tool on your website and see how easy the booking process it. Create a client account and test out sending electronic paperwork. Test the program from both the client and practice owner perspective. One key way to set yourself apart and efficiently run day-to-day tasks is to have a solid process for booking, paperwork, documentation and billing. Having a practice management tool that makes these elements easier can save you a great deal of time. If you do opt not to use an all-in-one practice management tool or EHR, be sure to test out the tools and process you decide on from the customer perspective. Make sure that the process is clear and as easy-to-complete as possible. This tool, Getting Started with Nutrition Coaching is a helpful overview of what your process might look like. Reimbursement for your services is an essential consideration. Will you be cash-pay only or accept insurance? If you plan to accept insurance, it can feel overwhelming to figure out the steps in the process. Leveraging the expertise of colleagues with experience can help to make the process easier. This toolkit offers a comprehensive set of tools and videos on reimbursement. Determining how to price your services, track your expenses as well as forecast revenue can help you to better manage your cash flow. Having a comprehensive and easy to use spreadsheet can help you stay on target with your business goals. For some insight from an experienced practice owner, this article from Felicia Porrazza, MD, RD, LDN gives an overview of the steps to starting your private practice including steps in the process if you plan to accept insurance. Getting your business off the ground will mean that you need to consider a few legal elements. This is not legal advice and you should consult a lawyer for specific details. Working with clients will mean that you need some official paperwork. There are a few different terms used to describe this document, but it is often called a client agreement. This document can include a variety of elements including your cancellation policy, fees for no-show, billing information and more. If you accept insurance, you will also need to be compliant with any HIPAA requirements and have appropriate documentation. There are templates for key documents available which you can customize. Hiring an attorney to create custom forms or reviewing and revising a template can help to ensure that your forms are specific to your needs. If you accept insurance and bill directly for your services, you will need to be sure you’re compliant with any regulations. Your private practice will require forms such as a new client intake form to gather health history and other information such as insurance information or a diet history or 3-day food record. Some options to provide these to your clients are to have them available for download from your website or send via email. Many electronic health records allow your clients to complete these forms electronically and securely. If you are utilizing email to send and receive health information about your clients, remember to keep HIPAA compliance in mind and be compliant with any privacy laws you may be subject to. For client education handouts, you can create your own or purchase from sites like RD2RD or the Academy of Nutrition and Dietetic’s, store. It is also common to provide electronic copies of education materials via email or electronic health record. Other popular tools include a documentation template for client visits, referral forms to provide to providers and visit summary to provide to client or provider. Your new business will need essentials like phone (and perhaps fax), email and if you offer virtual visits, web conferencing. Remember that if you are subject to HIPAA requirements that you need to ensure that services you choose meet the necessary requirements and can provide you with a Business Associates Agreement. You should also consider how you will keep records of your business expenses and if you will need the services of an accountant or bookkeeper. Tools to track and predict your expenses can help keep you organized for taxes. In this article by Erica Julson, MS, RD, CLT she gives a comprehensive overview of all the business essentials including a timeline and costs. Your website is an important tool for both attracting new clients as well as may function as a store to sell your products/services and a blog. Most registered dietitians spend a great deal of time on the design and appearance of their website. You can build your own website utilizing DIY-friendly website builders like Squarespace or Wix. WordPress.org has a steeper learning curve, but more customization and features for bloggers. If you choose to hire a professional, there are a variety of options from full-service design firms to freelancers. Be sure that you carefully review the work portfolio prior to making your selection. Another consideration with website design is if you will maintain your own website or if you will need to hire a professional to make ongoing edits to your site. Be sure that you have a plan for how this will work, so you don’t have a website that is a “black box” that you don’t know how to update. In this article by Whitney Bateson, MPH, RD, she gives insight into how to decide if hiring a professional to design your website is right for you. To get clients for your nutrition practice, you will need a marketing plan. This may include both local, in-person marketing as well as online via social media. For in-person marketing, you might need to design flyers to distribute to local physician offices, referral pads and business cards. For online marketing, you can utilize social media to share blog posts you have written, articles by others or video (live or recorded). You can leverage advanced tools such as a webinar or a free download to attract new leads. One strategy is to create an email list that people can join to receive updates such as a regular newsletter, blog post updates, recipes, tips and more. Once people have joined your email list, they can decide to work with you or purchase your services. If you offer in-person events, you can utilize this a way to add new subscribers or using digital content such as blog posts, social media posts or videos. In this article by Samara Abbott, MSEd, RD, LDN, she gives insight into how to choose marketing strategies for your private practice. She has many articles on her experience starting a private practice. Starting a nutrition private practice is a big task. Keeping motivated as well as staying focused on the most important priorities can be difficult. There are many options to get expert advice including masterminds, local small business groups, paid individual mentors and group programs. Creating a network of both mentors and colleagues is valuable to help answer questions that arise as well as ensure that you are making decisions that are best for your business and will lead to a successful practice. While nothing can take the place of an experienced mentor or coach, it can be incredibly helpful to learn from the journey of others. 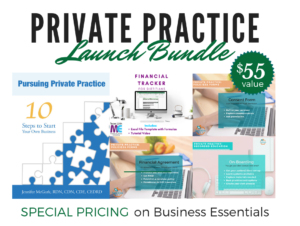 These RDs have chronicled their experience starting a private practice into a detailed article with advice, humor and a fresh perspective on being a business owner. Starting a private practice and becoming a business owner is exciting and intimidating. There are essential resources that your practice needs to get off the ground and run efficiently. 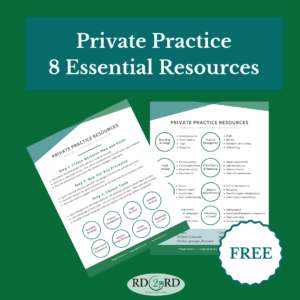 RD2RD is your one-stop for tools needed for your practice. Choose from a selection of tried and true resources from Registered Dietitians business owners. From forms, toolkits, handouts, video lessons and more, save yourself time by not spending time recreating the wheel for business essentials. Nutrition Private Practice Resources – Get Organized! This convenient, 2-page guide lists the 8 essential resources your nutrition practice needs to get off the ground. From branding and design to practice management and marketing, this guide outlines the basics.